A few weeks ago I was thinking about eccentric ways to invest money and somehow I stumbled on the idea of buying a ball team. After lots of research I decided that if I had to buy a team, I’d buy a team of the most popular sport in the world–soccer (futbol). Since you can’t walk into a shopping mall and purchase a team I had to search around for a different way to approach the situation. While researching, my brother triumphantly marched into my room and announced “I’m going to be on the soccer team.” The exuberant glow from the 50,000 lumen light bulb in my head began to illuminate and that’s when it came to me–I’m going to buy my brother’s team! I made a few calls, filled out a few papers, mailed a check and VOILA, I have my own team! 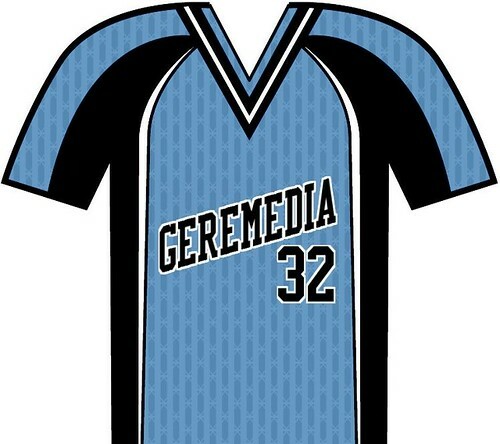 Geremedia, LLC is now the proud sponsor of one of the town’s junior soccer teams. More pictures to come when the season starts in September! My kiddies better be undefeated this season! !